War Games started as a novella, then grew to about 50,000 words. I expanded it to about 75,000 words to get it up to novel length, submitted it to a publishing house and got an R&R (Revise & Resumbit) letter from them. Taking heart from their suggestions, I added another 27,000 words. The house accepted the revised novel BUT I wasn’t happy with some of the contract clauses. This is a tough one. Every author wants so badly to see their work in print. But the clauses were rather infantile (Do not say anything critical about the house to anyone! Well, what if they do something wrong? I’m not allowed to talk about it? And how enforceable is a clause like that anyway?) and they tied any future stories down to a mindboggling degree. I walked away. In the year that followed, I tried to get other publishers interested in War Games but I was told that f/f doesn’t sell very well. Oh dear. Visit her site for the rest of the tale. What can you do when you start falling in love with the woman you’re meant to kill? Laisen Carros is an agent of the Fusion sent undercover to infiltrate the Perlim Empire. However the years she’s spent impersonating military commander Cheloi Sie are starting to wear her down. To Lith Yinalña, Cheloi Sie is nothing but a war criminal and Lith considers it her personal mission to kill the Colonel. Unfortunately for Laisen/Cheloi, the Empire and an idealistic assassin aren’t her only enemies. When Laisen and Lith start falling in love, it’s only a matter of time before someone else notices. And acts. And look! 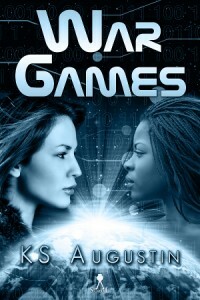 The WAR GAMES cover promises an interracial romance to boot. I must say, I'm feeling quite warm and fuzzy about the fact that authors are willing to take risks to deliver a type of story that readers like me are eager to devour. Yes, I recognize I'm probably in the minority. But in a sea of stories that take a "safe" path to the HEA, it's refreshing to encounter a few that dare to plumb new depths. Even if f/f is not your thing, you gotta hand it to authors like KS Augustin and Cathy Pegau because they clearly embrace innovation and fresh approaches to the subgenre--even if it means having to pursue alternate publishing options and risk the possibility of lower sales. Even more amazing is that these stories have a better chance of survival because of the market for ebooks. Like, wow. That's the beauty of niche.